That quote sticks out to us as we look back at the five-year conversion process that was the Universal Building, located near West Town in Chicago. As roofing contractors, we have a tremendous amount of experience in the construction industry. Prior to our work at the Universal Building, we had worked on numerous loft office conversions in Chicago, but we had never taken one on all by ourselves. The process began in 1999 when we were looking for new office space for our firm, Windward Roofing. That’s all it started off as, an office search, but like a lot of things in life, a planned path sometimes takes unexpected turns. 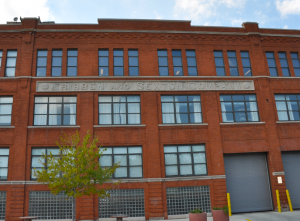 In this case, an office search turned into a conversion project for a nineteenth century manufacturing facility into modern loft office spaces. That was definitely not in the game plan when we set out that morning. We were actually checking out another property in the neighborhood when we saw the Universal Building for the first time. 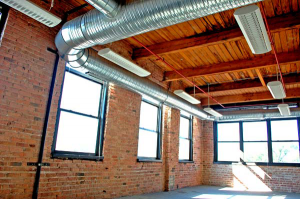 After working on residential condo loft projects such as 411 Ontario and the Sexton Lofts in Chicago, we knew how the conversion process worked. There probably was risk involved with this project, but we really didn’t look at it too much. We just believed it was the right move. So, after a little negotiation, we bought the Universal Building and set to work converting it to creative loft offices. To convert the Universal Building to creative loft offices that would attract tenants, we pretty much had to revamp almost every portion of the building. The overhaul included updating all of the building’s utility systems, replacing the floors, windows and roof, adding an elevator, sandblasting, tuck pointing and piping the entire building and adding modern utilities such as internet. One of the first steps we took was to clean up the building’s environmental problems. 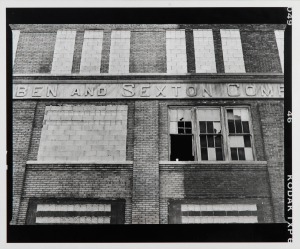 Serving as a manufacturing facility for more than 100 years, the property had accumulated its share of environmental damage. We then put on a new roof, followed by sandblasting and tuck pointing to give the building the classic loft office look that we wanted. We then did the ductwork and poured new floors to cap it off. After that, it was important to work on the layout. Our goal was to produce modern loft offices and the building’s layout did not initially support that. We put in a passenger elevator and then examined the floor plan. With the help of John Figlioli of Garrett Realty and Development, we devised a layout that would be amenable for loft office spaces. This was a key step for attracting multiple tenants and allowing flexibility for different floor plans. The construction work was intensive, but it really wasn’t the most difficult portion of the process. We had done Chicago loft buildings before successfully and we were able to take it to new heights with the Universal Building loft offices. If we are honest, the most difficult thing was the financing. We could have completed the entire building in a rather short amount of time if we had all of the funding up front. As most developers know, that’s not always the case. To get proper financing, lenders want to see leasing. Well, to get many leases, you have to have a well-financed and built-out building. That’s why we decided to tackle it piecemeal and take several years to complete the loft offices. By 2003, we had our first tenant, and in 2005, the project was complete. We would like to give credit to JDI Realty, which gave us an initial loan to complete many of the basic rehab procedures, and ShoreBank, which provided a substantial loan to finish the project once we were 50 percent leased. All in all, it was quite an adventure, but it’s paid off in more ways than one. With the Universal Building, we are able to provide wonderful Chicago loft offices at an affordable price to creative firms. The building has also become a point of pride for those of us who put a lot of sweat and equity into the project. When everyone from prospective tenants to Chicago fire marshals and building inspectors walk the building, they always compliment us on the amazing work that we have done. We feel like we followed this same advice throughout the entire process with the Universal Building. From the onset, we didn’t really concentrate on what kind of tenants to attract. We just knew that if we built the loft offices right and concentrated on high-quality construction work, the tenants would come.